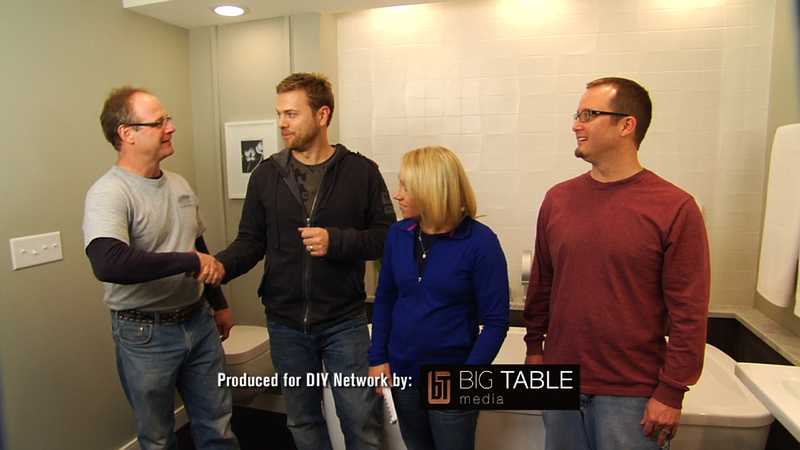 Posted on March 15, 2013 by Wuensch Construction Inc.
Jeff Wuensch with the home owners and host Matt Muenster shaking Jeff Wuensch hand to thank him for a job well done. 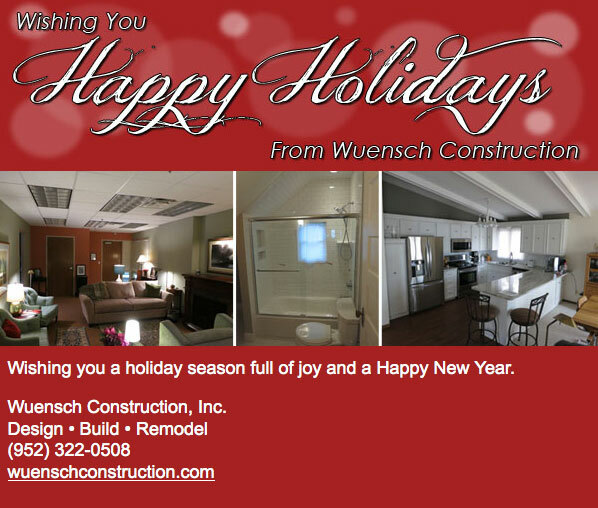 Wuensch Construction has seen a vast variety of changes in design trends over the past 30 years in kitchen remodeling, bathroom remodeling. Designing trends change from year to year and keeping up with is it is hard to do. At Wuensch Construction, we work together with designers, show rooms and team partners to stay on top of what is trending and what is not. We explore articles from trade and design magazines to keep us informed and share the trends with or co-worker and team partners. Wuensch Construction wants to share these trends with our readers so they can be informed when they come to do their next project. So we picked the top 5 kitchen and bathroom remodeling trends you will see 2013. 1) White painted cabinetry has become very popular and will stay on top for cabinet finishes. Blending dark, light and natural finishes together is gaining popularity. 2) Glass backsplashes has grown popular over the past few years with will be top in 2013. 3) LED lighting has grown in popularity as consumer awareness of energy efficiency and alternative green lighting has risen in the past 3 years. 4) Pull out faucets stay in top position with pot filler faucets comes in second in 2013. Touch-activated faucets are growing in popularity as consumer awareness of efficiency with water consumption. 5) When it comes to faucets, appliances in the kitchen Satin Nickel has been on top for the last couple of years and will stay on top for 2013. 1) White and off-white remain the top color schemes for bathroom remodels with beige coming in second. 2) Granite is the most used counter surface material use and remain on top with Quartz coming in close second. 3) Under-mount sinks remains the most popular type used in bathrooms. 4) Transitional styles bathroom are still on top but we are seeing a blend of transitional and contemporary growing in popularity. 5) Ceramic/porcelain tile flooring remains the most popular of all materials with stone coming in at a close second.